The number of presbyopes continue to rise, but currently only 46% of presbyopes are fitted with a contact lens option. By 2020, the number of presbyopes in the U.S. is expected to reach 123 million, creating a tremendous market opportunity for optometrists who provide multifocal contact lens options. At the same time, the demand for 1-day lenses continues to rise as do the number of silicone hydrogel 1 day lens fits. With a full family of 1-day SiHy options, clariti® 1 day enables you to take advantage of this growing market segment and fit your presbyopic patients with a lens that is convenient, highly oxygen transmissible, and affordable. Despite the belief amongst some practitioners that multifocals are difficult to fit, it’s easier than ever to fit multifocal lenses. The clariti® 1 day multifocal only takes 5 minutes longer, on average, to fit than its spherical counterpart. To give practitioners additional confidence in multifocal fitting, CooperVision has recently launched the Opti-ExpertTM app which is an interactive fitting tool to make multifocal fitting even faster and more accurate. 100% of wearers were successfully fit using two pairs of lenses or less. The OptiExpertTM tool is easy to use and easy to download. It takes the guess work out of fitting multifocals and saves valuable chair time. OptiExpertTM is already used by tens of thousands of practitioners around the globe. Patients love the vision they get from the clariti® 1 day multifocal. In fact, 92% of patients reported that the clariti® 1 day multifocal met or exceeded their visual needs. clariti® 1 day multifocal features four dedicated, discrete zones of stable power. 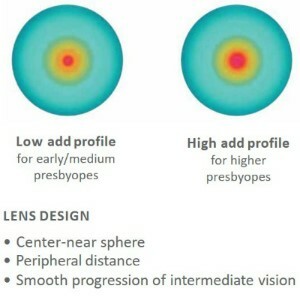 The unique dual intermediate vision zones are designed for the lifestyle vision needs of many presbyopes. Finally, patients appreciate the higher oxygen transmissibility of 1 day silicone hydrogel lenses. In a recent survey of over 1,500 contact lens wearers, 75% of patients expected their ECP to prescribe the healthiest option regardless of cost. And in a recent survey of US ECPs, 7 out of 10 doctors who wear 1 day lenses reported that they choose 1 day SiHy for themselves. So why not offer your patients the same high oxygen transmissibility, convenience and clear vision with clariti® 1 day multifocal? Need help fitting your presbyopes? Don’t worry – we have an app for that. Learn more on the CooperVision OptiExpertTM page or download for free from the Apple Store or GooglePlay. Check out ECP Viewpoints℠ this month for additional multifocal fitting tips and success stories from Stephanie Woo, OD, FAAO, FSLS as well as other clinical updates from CooperVision North America Professional Affairs. Morgan P et al. International contact lens prescribing in 2017. Contact Lens Spectrum 2018 Jan;33:28-33. Market Scope. Global Presbyopia-Correcting Surgery Market Report. April 2012. Validation of Multifocal Soft Lens Power Calculator in OptiExpert: Application for clariti 1-Day Multifocal Lens Fitting on Friday, November 9 from 10 a.m. – 12 p.m. (Board #158).